I make no apologies for this ridiculously fantastical list of expensive but arthritis-friendly gadgets. A girl can dream - and this one dreams of crazy, shiny kitchen machines. Frankly, being sore shouldered, wonky wristed and fumble-fingered should have a few perks... so this is my 'if I have to put up with arthritis please compensate me with kitchen toys' list. Tefal Fresh Express - chops, grates and slices vegetables and can be cleaned in the dishwasher No idea if it is any good but it looks pretty handy for those of us with arthritis. Anything from Joseph Joseph - they prove that you can design user-friendly cooking equipment that looks great and is a joy to use. I've got the nest of bowls but I'm hankering after one of their lightweight chopping mats and the square colander. The switch peeler looks like it might be handy when I really should peel spuds for those Christmas roasties too. Bosch Food Processor and Mixer - this is such a good idea. It's a kitchen mixer and food processor in one. No more messing about with lots of different pieces of equipment. I currently use a hand mixer and frankly don't need to mix stuff enough to justify a giant, expensive KitchenAid type mixer but this really appeals to my love of space-saving, multi-tasking gadgets. The Christmas party season is upon us. People are already riding the tube home looking glazed from mulled wine with tinsel in their hair. Carols are being piped out in every shop and you can't move but for being offered mince pies. If you are having people over or want to take a foodie gift to a party, try these mini muffins. They make a delicious nibble with drinks and are easy to make, even with arthritis. The great thing about muffins is you really only need to mix the batter until it is just combined, stirring too much makes heavy, gluey muffins so they are a great thing to bake if stirring hurts your joints. I like the combination of cheese,mustard and black pepper in these but you could also try adding herbs, spring onions, ham or even paprika for a different flavour. Make them in advance and freeze them so you are party-ready - no tinsel required. Heat your oven to 180C and line a mini muffin tin with 24 cases (or a large one with 9, if you prefer).In a bowl or jug, lightly beat the egg, oil, mustardvand milk together (a milk frother is a good lightweight tool for this if you find whisking tricky). Mix the dry ingredients and cheese together in another bowl. Tip the wet ingredients into the flour mixture and mix until just combined. Spoon the mixture into the cases until 3/4 full. 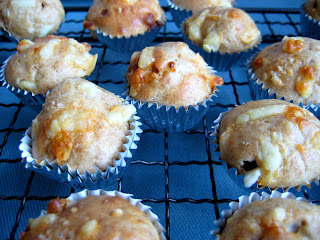 Top with a little extra cheese and then bake for 15mins for the mini muffins or 25 for the large. The muffins are cooked when well risen and golden. They are best eaten on the day they are made or you can allow them to cool and then freeze them. Reheat for 10 mins in the oven to serve. Christmas can be a challenge when you have arthritis. Preparing food for family and friends can be tricky when you are exhausted or in pain. Equally, the onslaught of festive food can leave you feeling stuffed and sluggish. Take a look at my how to stay healthy over Christmas tips for ways to enjoy the season without making your arthritis worse. You will have to excuse the lack of posting recently - I've had pretty much every bug going and spent most of this winter curled up, dosed up and wrapped up. So there hasn't been much cooking or eating going on. As much as I love the arthritis tackling effects of Humira and other disease modifiying drugs, I'm not a big fan of how exposed they leave me to all the Autumn lurgies. One of the few things I have been able to stomach amidst all this is soup. There is only so much shop-bought soup I can deal with though, they pretty much all taste the same after a while, and there is something especially soothing about real home-made soup. This is a very quick, simple little soup that always hits the spot. It's like a hug in a bowl. Make a double batch and freeze the leftovers so when the lurgy strikes you have some on standby. Peel the onion and chop into quarters. Pour olive oil into large pan and add onion. Throw in the squash and potato. Cover with the stock and bring to a low simmer. Cook for 20-30mins or until the vegetables are soft. 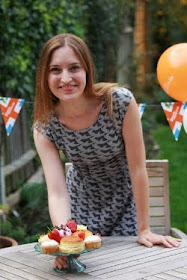 Whizz up with a hand blender and serve. 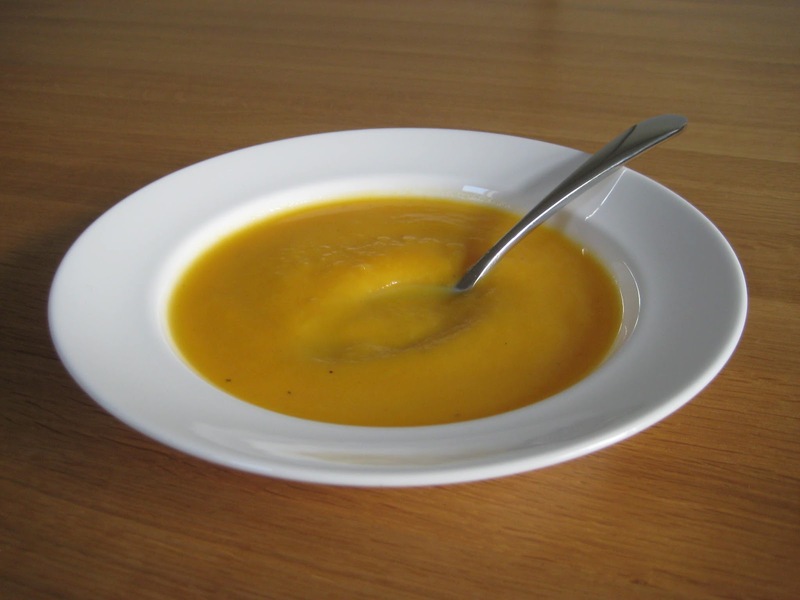 Onions have anti-viral properties and butternut squash is rich in betacarotene and vitamin C making this a good cold-busting soup for when arthritis drugs have left you lurgy ridden.